I’ve been making this slow cooker pot roast for years and it’s become my favorite go to cold weather meal. Several of my friends and relatives have tried and love too and it’s a huge hit with kids because the sauce is a little sweeter than usual. The spices add a little heat but are not overwhelming and it’s SUPER easy! 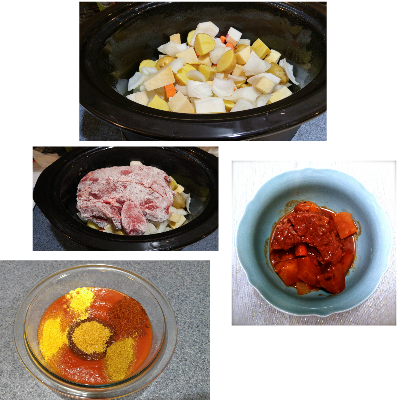 Just add chopped root vegetables and onions to the slow cooker, toss the beef in flour, whisk together tomato sauce, brown sugar, chili powder, cumin, mustard powder, garlic powder and pour over beef and veggies then cover and turn on high for 8 hours. Tweaks and substitutions: This recipe uses root veggies but if you don’t like rutabaga or parsnips – subsitute with whatever you like or usually cook wiht your pot roast. If you aren’t a fan of sweet sauces – you could cut back on the brown sugar – or you might want to skip this recipe. If I have the time I brown the beef after tossing it in flour before adding to the slow cooker but it’s fine if you can’t. I like the extra flavor it adds though. Really? Do you not have them there? They're so cheap. I love slow cooker meals and we'll have to try this one out! 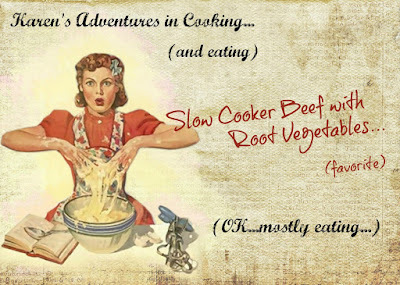 This sounds really good and I love anything I can make in the crock pot! Thanks for sharing! I have never heard of that! I'm sure this recipe would be adaptable though too. I'm such a fan of sweet sauces and using a slow cooker. I support all of this! Yeah - you have to like sweet but I saw int he comments that a lot of people cut the sugar. I don't think it would be an issue. Karen this sounds so delicious! I really want to try it out but I hate cooking...gonna have to give my mom the puppy dog eyes this weekend. LOL! that looks yummy and I admit that I use my crockpot quite a bit :) I will have to try this out. oh dang this looks good!!!! !I love using my crockpot....cheap and easy. Its the best device I have for cooking!!! hehe Will remember this recipe. 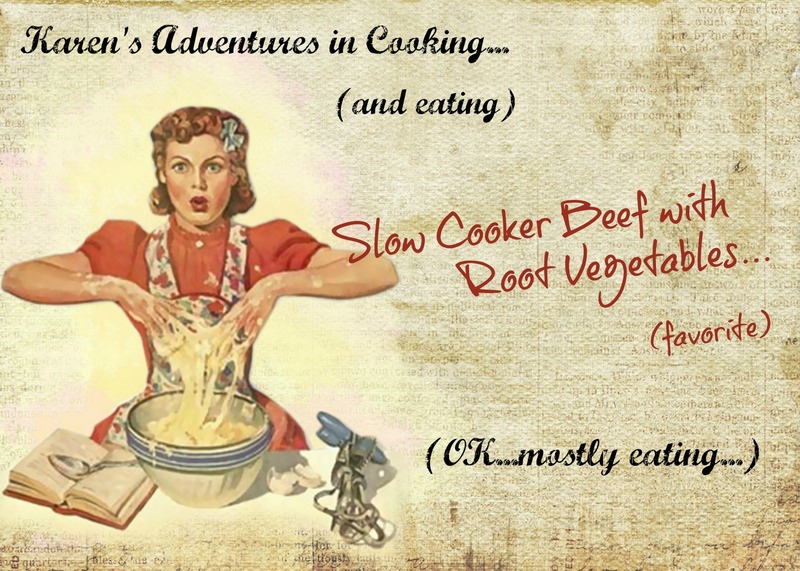 Slow cooker pot roast is my absolute fave winter meal. Yum.